Open Spear Ranch horses are born and raised in the open pastures and hills of Melville, Montana located north of Big Timber. 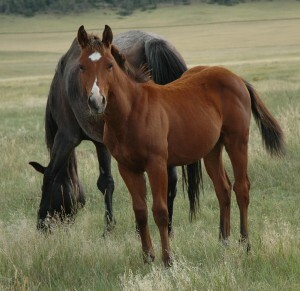 Mares are pasture bred in May and June and foal naturally on several thousand acres of green fields and rocky hills. With the variety of terrain on the ranch, the foals learn to cross streams, negotiate steep & rocky hills, and avoid predators. More importantly, this environment aids in the development of good feet and strong bones. Open Spear Ranch also runs about 650 head of commercial Angus and Hereford cross cows/calves that are often pastured with the horses, so the foals are exposed early to interacting with cattle. We welcome visitors and offer accommodations to those traveling a distance. We look forward to meeting you and showing you the horses we have available. Just email or give us a call!! Click here for directions.